An effortlessly stylish contemporary design, this kitchen’s supreme functionality is accompanied by elegant accents and a strikingly coloured feature wall. Right from the very beginning, a primary concern for Mr and Mrs Green from Blackburn was space. With frequent visits from their extended family, they wanted a single area in which they could all cook, eat and relax alongside each other, without too much bustling back and forth. A revitalisation in style was called for, in a room that could provide plenty of space and light to make them comfortable. 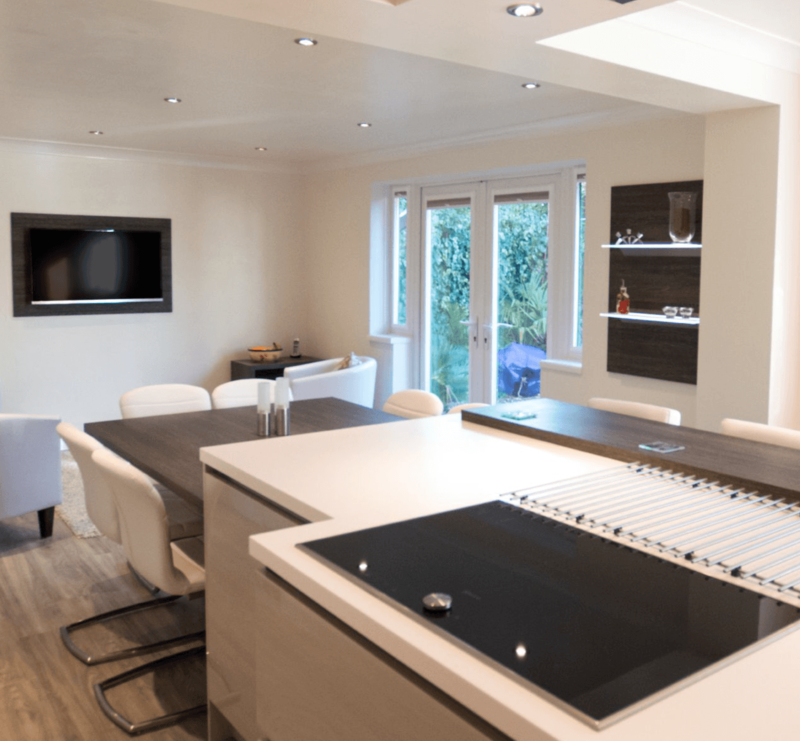 Mr and Mrs Green visited a couple of designers to see how they could help, but they were blown away by the initial sketches from Kitchen Design Centre. “It just met all the criteria,” enthused Mrs Green. What’s more, the superior quality of KDC’s customer service was apparent right from the get-go. 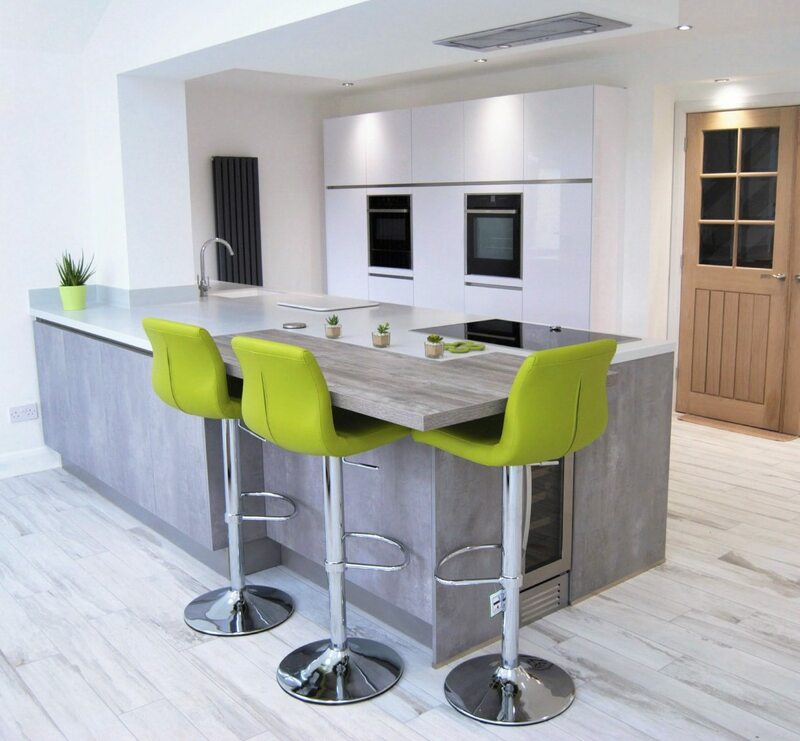 With the help of award-winning designer Lou Roberts, Mr and Mrs Green embarked upon the transformation of their kitchen. 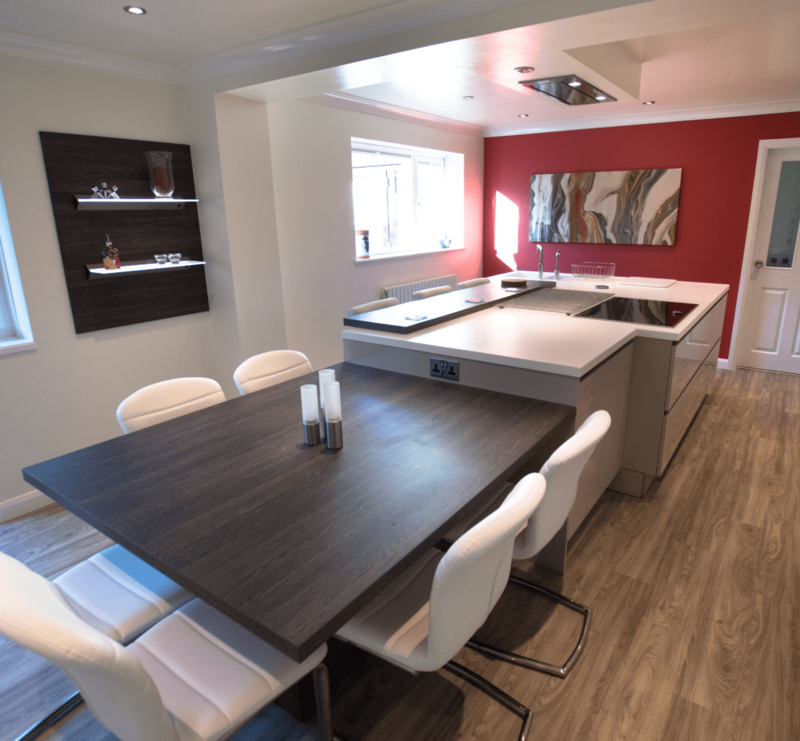 Exercising her trademark design talents and the meticulous attention to detail that makes her so highly valued by KDC, Lou at our Blackburn kitchen showroom designed a contemporary, versatile room that fulfilled the functions of living, kitchen and dining area all in one space. 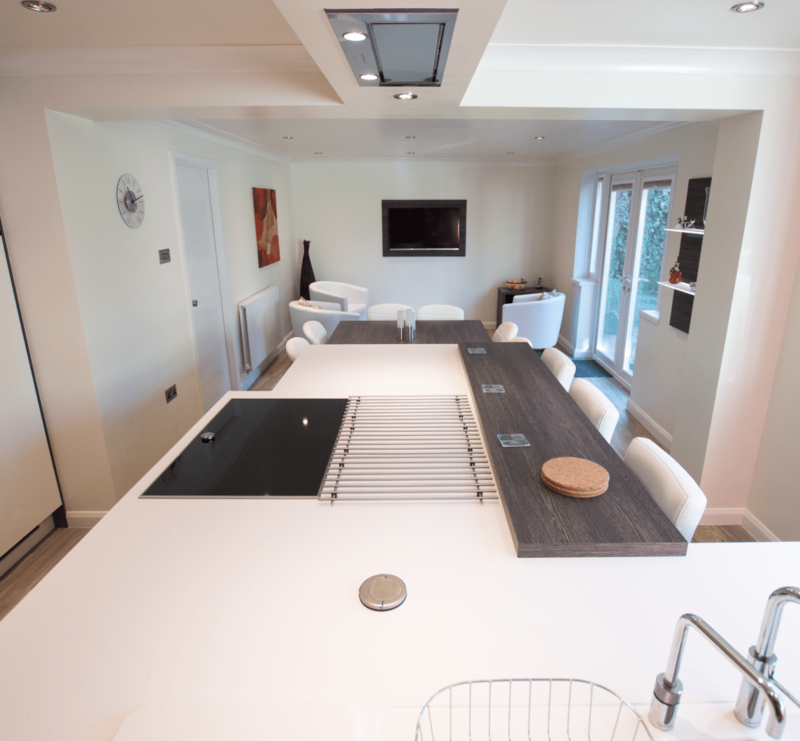 Built for entertaining, the kitchen seats up to 6 people as opposed to the standard 4, allowing Mr and Mrs Green to sit and eat with their family. The kitchen also incorporates a variety of differently styled seating for different purposes, further underlining the versatility of the room. 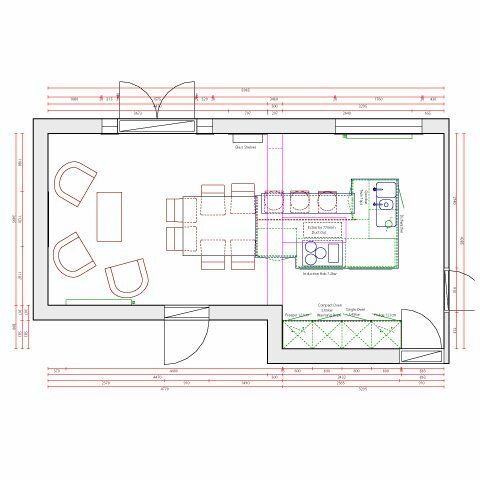 Economy of movement was a central principle in its design: the aim was to maximise the use of available space, and therefore minimise the amount of unnecessary walking back and forth during meal preparations. 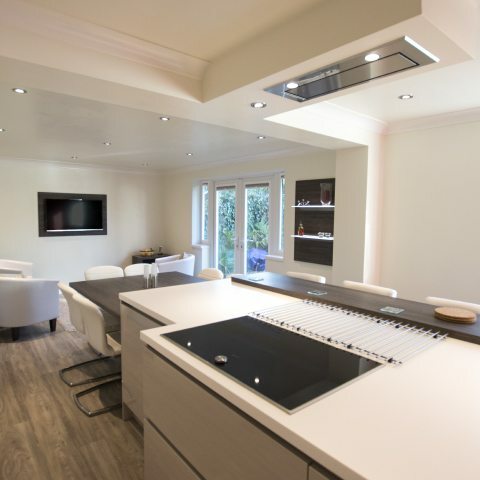 The final design brings together an array of appliances, surfaces and seating to create a compact, efficient kitchen. What’s more, there’s no more walking back and forth between rooms – it’s just a matter of passing the plates over to the dining area. The room’s supreme functionality is supported by an effortlessly stylish contemporary design that’s beautifully embodied in the sleek handle-less storage units, while the breakfast bar and dining table show off a striking wenge wood look, elegantly accented by white jasmine corian. 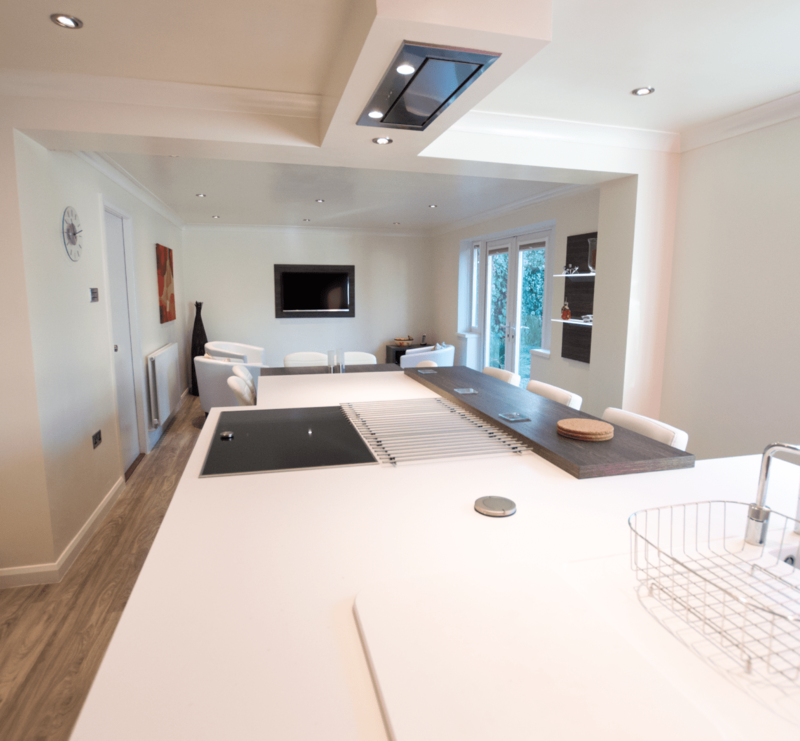 The feature back wall was shaded in black to provide a striking colour contrast to the neutral kitchen tones – an aspect especially loved by Mr and Mrs Green since the initial stages of the project. Meanwhile, the kitchen is outfitted with a diverse selection of appliances that cater to the client’s every need, including a premium, top range Neff oven and warming drawer, fridge and dishwasher, all superbly engineered by Neff and stamped with its seal of quality, with a Victory extractor fan installed above. 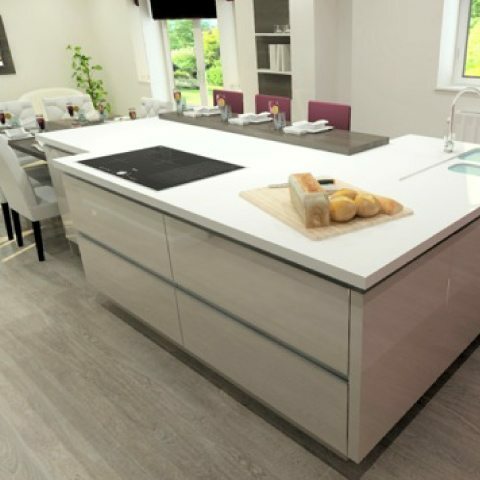 "Kitchen Design Centre are absolutely brilliant, and couldn’t do enough for you. Lou is a lovely girl, and so good at keeping us informed. 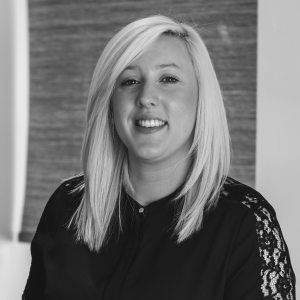 We got a smashing service from the KDC team in Blackburn." "Mr and Mrs Green were looking for some ideas on how best to utilise the space, while still keeping that warm homely feel. 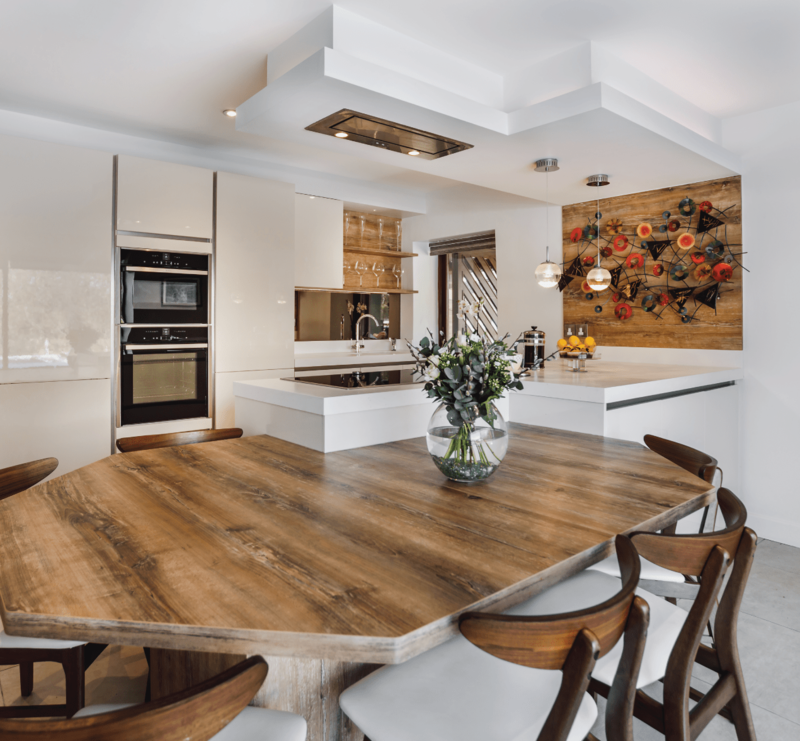 The most interesting feature has to be the shape of the kitchen island – how it tucks in to allow a better walkway around the kitchen, and the L shape that allows for a breakfast bar around the back while still leaving enough space to sit and walk round comfortably. The change was so dramatic that when the clients came to look at the initial ideas they didn’t recognise their kitchen, and the experience of seeing the transformation as it happened was fantastic."